OVID TOWNSHIP – From Chicago, Detroit, Fort Wayne and Kalamazoo they came last Saturday to Lockwood Community Church, where the Monroe Street Alcoholics Anonymous (AA) Group of Coldwater hosted a “Back to Basics” program on the 12 Steps. The guest was Wally P., who made a decision to carry the message to others 22 years ago in the home of the late Dr. Robert Smith, who along with Bill Wilson was a co-founder of AA in 1935. Wally, anonymous here due to AA tradition, said he had traveled to the home of Smith in Akron “on a whim,” and found himself with a people, each with 40 (or more) years of sobriety. 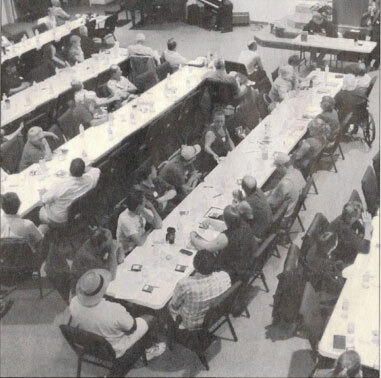 There he discovered AA meetings as they were held in the 1940s. This particular meeting happened once a year. He came away with a commitment to research “beginners’ meetings” that took problem drinkers through the steps in four one-hour sessions, as they came into the program. “In the process, they discovered a God of their understanding and a new way of living based on the guidelines of trust God, clean house and help others,” Wally said. Welcoming all to the “1946 re-enactment” meeting, he gave an overview and said the program is “a spiritual way of life” that begins with the first step, which is surrender, with acceptance of “powerlessness” over alcohol. The next session dealt with steps to, three and four and the necessity of grasping the concept of a “higher power,” before taking a moral inventory of the self along the lines of a business ledger with assets and liabilities. Session three, steps five through nine, was putting the program into action: Acknowledging wrongs, dealing with character defects, and be willing to have God remove them before going on to make amends to people where ever necessary. Going over steps 10, 11 and 12, he said people can begin to live lives of honesty, purity, unselfishness and love. “There is security in recovery, and helping and working with others,” Wally said. Not everyone in the crowd was alcoholic or of some other addiction. Richard Bowerman was there because he was part of the jail ministry in Branch County and in Angola. Noting that if alcohol and drugs are not the primary reason people are in jail, he said they are often a major contributing factor. “I’m just here to find out anything that will help me get through to the guys in jail,” he said. Wally said an “angel on the ground” got through to him many years ago and put them on the path that led him to Smith’s house. He came back from the Vietnam War addicted to opiates, and for years went from city to city, drug to drug. He said he could leave drugs alone, but alcohol ruled him. “Alcohol kicked my (behind),” he said. Wally has a bachelor’s degree in research chemistry and a masters in statistics, but the statistic that matters most to him is that he is shared “Back to Basics” with 500,000 people, and estimates 300,000 people are alive (today) because of it.